Bold, beautiful front doors are in, if you haven't noticed. 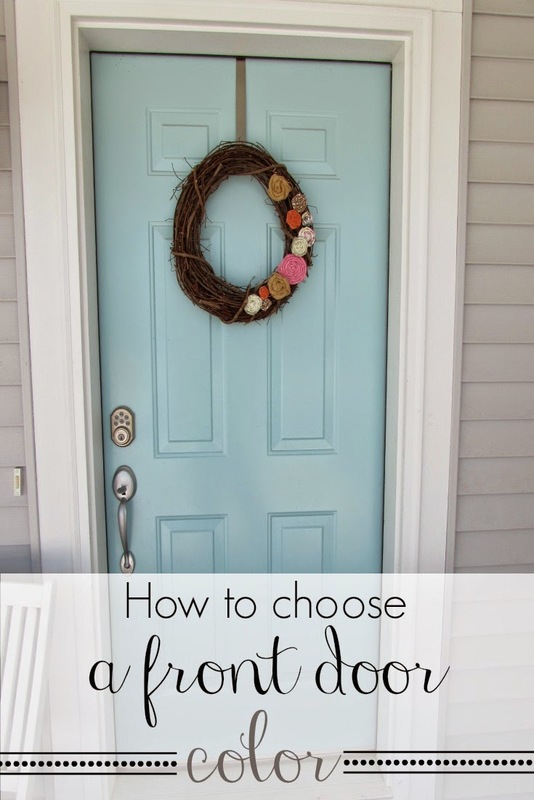 But the million dollar question is, how to choose a color for your front door. I'm sure this all started with Pinterest. At least I am guessing. I mean, what didn't start with Pinterest?! When we built our house last year, we had to choose 1 interior wall color and a front door color. The wall color was basically a giant sheet of different whites and off whites, and the door color could be literally any paint color that Sherwin Williams makes. Talk about impossible. How do you narrow it down?! To make matters even harder, our house is the very first house when you enter our neighborhood, so I totally felt like there was pressure (that was only coming from myself, of course) to set the tone for the whole neighborhood. Who wants to look at an ugly front door every time they come home or have friends come into the neighborhood to visit. Whew! Eventually we got there, and I have been obsessed with the color we chose. I continue to receive countless compliments on it from people who come to visit or even just random people driving by. So how did we finally narrow down the thousands of colors and choose the perfect one? Read on, my friends, read on. First, you'll want to narrow it down to what you DON'T want! You probably know if you don't want a brown door or a green door. This will be easy to take out several color families right away and possibly even cut your choices in half or more. For us, I knew I either wanted a black door (which would have been totally simple), or some shade of turquoise-y or yellow. That took out so many other color schemes. Second, find inspiration. Browse Pinterest for gorgeous front doors, do a google search for "your color front door", check out HGTV or Better Homes & Gardens, etc. There are so many beautiful options out there that you might want to piggy back off of. Third, take other things into consideration. What color is your house? What colors are in your front yard (flowers, greenery, water perhaps, etc.)? Do you have accent colors, like ORB fixtures on the front that you want to coordinate with? When I was having a terribly hard time deciding between a shade of turquoise and yellow (I had already eliminated black), I realized that my siding was way too light for a bold, bright yellow front door. Our siding is very light gray and I felt like the bold yellow that I wanted would have stuck out like a sore thumb instead of just looking happy and peppy like I was aiming for. If my siding had been 2-3 shades darker gray I think I would have been more comfortable with it. Looking at these factors helped me to narrow it down once again. Maybe you have some beautiful orange flowers that bloom in your yard that you want to accent with. Think about all of these things and what colors will coordinate the best. Fourth, once you have narrowed it down to one or two color families, go get paint swatches. Personally, I feel like the paint swatches never are the same color on the sheet as they end up being on your wall so I do a combination of things. First, I google. "Paint brand Color Name" "i.e. Sherwin Williams Reflecting Pool". Of course every color looks different depending on lighting, what it is painted on and your monitor but I think this can really help you narrow it down. I think this step is crucial for eliminating some colors. It'll really show you which colors you may not want on your front door. After you have narrowed it down even more, go get samples. I used to avoid getting samples because it was just one more thing to pay for, but they are critical if you want to know what it is really going to look like. Finally, paint a few inconspicuous spots on your front door. Paint little spots with each of your samples so you can see how it will really look on your door. Check it at several times of day to see what it looks like in the early morning light, direct sun, sunset, etc. This will also probably help you narrow down ones that you don't like and hopefully by now, you will have just one or two to decide between! At this point you may just have to flip a coin ;) Or you can do what I did and send your 2 final picks to your husband and tell him to choose one and take care of business. Most likely you love both of the final picks so you will be happy with either one! Now you can sit back and enjoy your beautiful new front door (after you've done all the work to paint it which I have no tips on because our builder did it for us, sorry! )!